◆Hydrogen and oxygen carbon remover uses water as raw material, power is used to decompose water into hydrogen and oxygen, hydrogen is used as raw material, oxygen is used as combustion aid, and it is fed into the car engine through the air inlet and is mixed with gasoline and air for combustion. Use the high temperature of hydrogen combustion to remove the carbon deposits in the combustion chamber! 1, cold ignition is difficult to start multiple times, hot car normal. 2. The engine is unstable and fluctuating. 3, add empty oil, the feeling of poor acceleration, there are bored phenomenon. 4. Poor driving performance, especially when overtaking, the speed increase response is slow and the original vehicle power cannot be achieved. 5, exhaust is very harsh, pungent, and severely exceeded. 6, fuel consumption than ever before. Combustion chamber, intake valve, fuel injector, throttle, spark plug, etc. Pure hydrogen and oxygen can be used to clean carbon deposits. 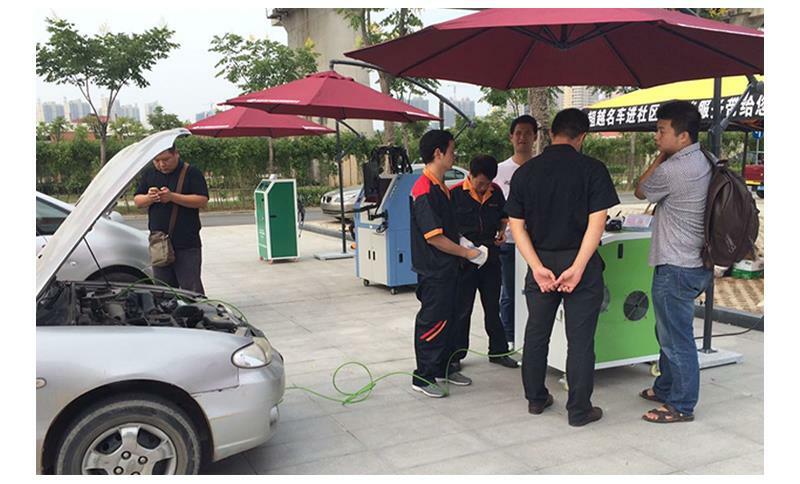 No need to add chemical carbon solution, because the addition of chemical carbon solution will produce gas-liquid mixture reaction, which will cause damage to the car and the spark plug will be affected. It is unsafe!